I’m really excited about this one, because 1) it’s a great non-food gift that I can give to my kids’ teachers (I mean, they get tons of candy and cookies already! ), and 2) I LOVE how the free printable tag turned out! 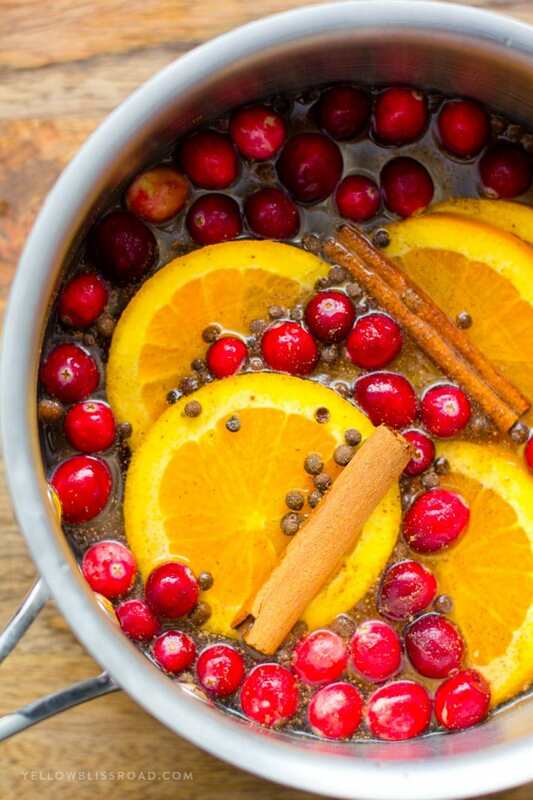 I love to fill my home with amazing scents during the holidays, and there’s no better combination than citrus and cranberry mixed with cinnamon and spices. This is a simple recipe that you can simmer on your stovetop or in a crockpot to help fill your home with these delicious scents. All of these ingredients are combined in a small pot on the stove. 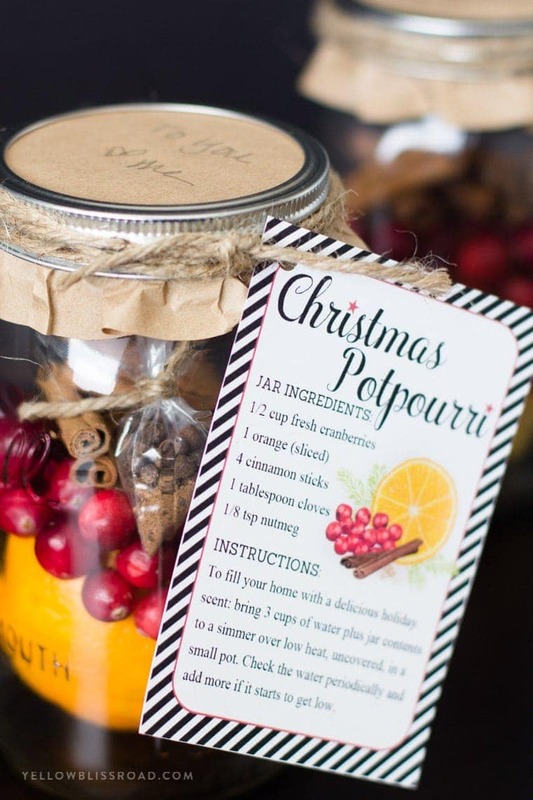 This Christmas Potpourri in a Jar comes with a free printable and is crazy easy to put together. It looks stunning, and it’s not just another food gift. You want to make sure that the vessel you choose is large enough for the oranges. If you plan to use small naval oranges, or maybe fresh oranges from your backyard tree, I suggest using cellophane gift bags (aff) that would be able to accommodate the larger pieces of fruit. There’s nothing worse than having to jam that orange through the mouth of a jar and the recipient not being able to get it out! You’ll note that on the recipe card it says “cloves” but in the image I used allspice. While these two spices do have different scents, they each blend nicely and one can be swapped out for the other based on what you have available. Be sure to make one of these cute Christmas gifts for yourself – trust me, these smell amazing and you’ll be glad you did. This recipe works beautifully in the slow cooker, too! 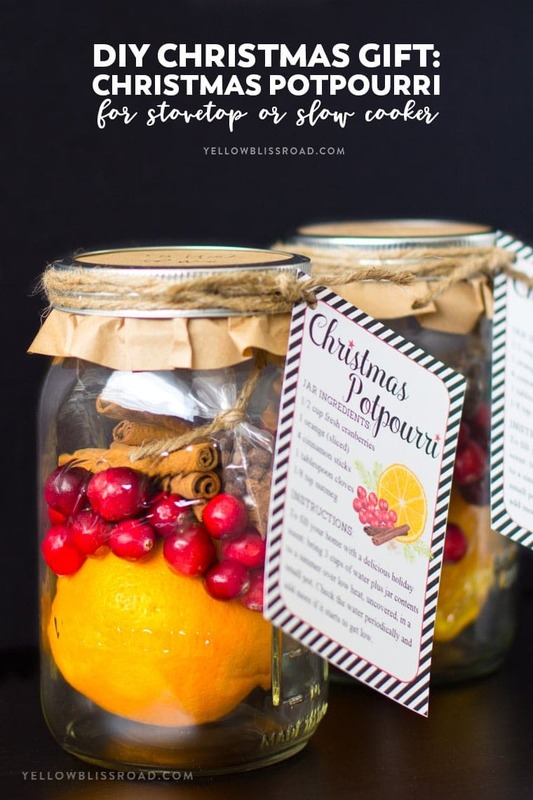 Ready to get to make a DIY Christmas Gift in a Jars? 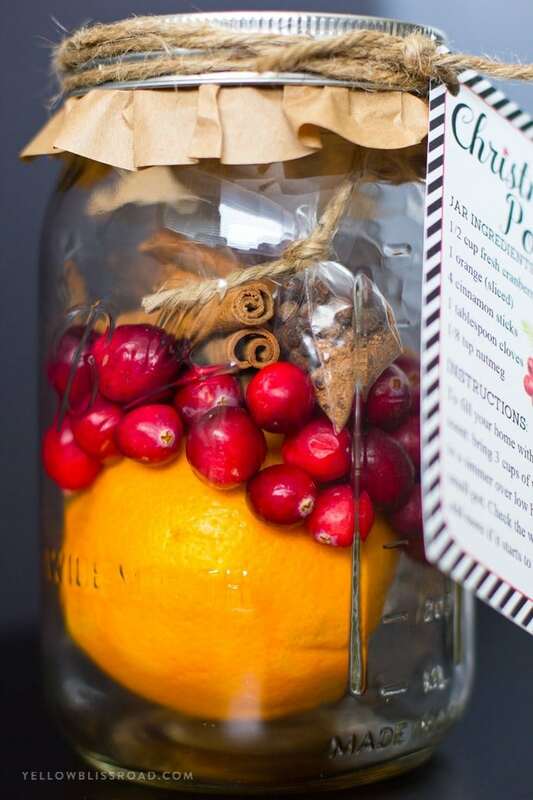 Take your jar or cellophane and place the orange, cranberries and cinnamon sticks inside. For the spices, it’s easiest if you place them in a small bag so they don’t just fall to the bottom. I simply cut the corner of a ziploc bag, poured the spices into that corner piece, then tied it with a small piece of twine. (See the video above for the visual). You could also just pour them into the jar if you like. Top the lid of the jar with brown kraft paper, wrapping paper or any other paper you like, secure with the jar lid band, then tie on the free printable gift tag with a ribbon or twine. The gift tag doubles as the instructions! CANT WAIT TO TRY THESE NOW. This is so cute, thanks for the printable tags! 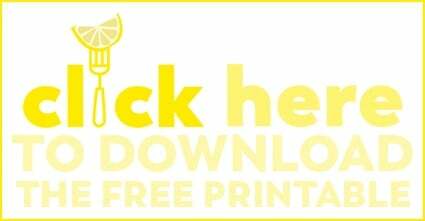 There is a yellow and white graphic towards the end of the post that says “download.” Click that to print the tags. I love this idea. Seems so simple to do for those who aren’t so crafty! Thank you for sharing your ideas with this group!